A note from Sarah: It has been a whole week since I swallowed back the tears as I hugged friends in Japan cheerio and then grinned my way out of Choshi marina, hauling Gulliver out to sea. What a morning that was – full of emotion and anticipation, preluded by not a lot of sleep the night before and just a mouthful or three of breakfast. I felt sick with nerves and excitement. 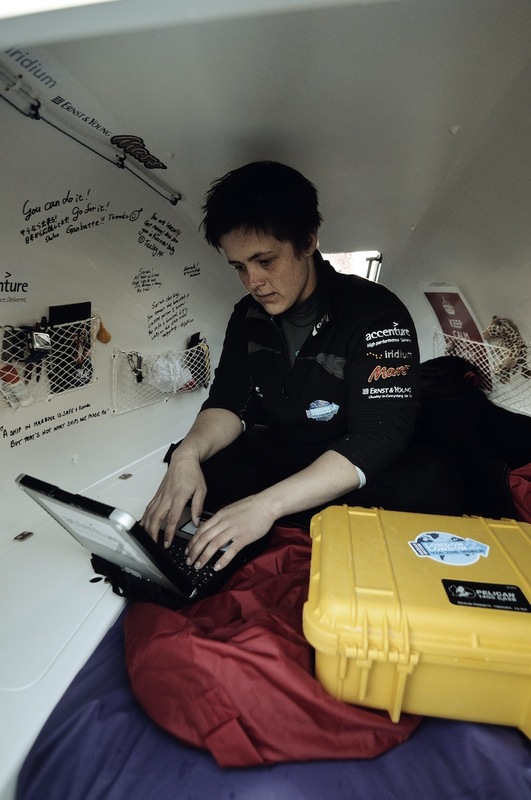 One week seems to have flown by in many ways and my life out here in my little capsule home seems normal. Except for this computer lark – I am still struggling with that. My eyes and stomach really don’t enjoy the screen and wobble combination of the waves. While I haven’t actually been sixk yet, I have just about ousted the queasiness, but the laptop brings it back each time.I know I am gaining control over it as I actually had a n appetite today for the first time and have managed to cook food two days running. We have 300 miles on the tally now and all but a few of them in the right direction. That’s about to change as this tomorrow a big str5ong blow is due from the east. We will be back on the anchor for a few days by the looks of it. Hopefully there will be no more capsizes with it – last week’s roll was not fun. Still, Gulliver did his bit and rolled perfectly. The broken vent piece shouldn’t be too big an issue either. I removed the gaffa tape repair in favour of air flow and will instead fashion a little removable cover out of a chopping board that I brought along to chop goodness-knows-what-with or indeed use for something fixable like this. Today has been a wonderful day, rowing in gentle seas, visited by two sharks, a group of dolphins and lots of birds. Whales and dolphins seemed to blow at some point on the horizon all day. Even if they don’t always come close it is so exciting to know they are there. Already I feel so lucky to have seen the creatues I have this week. # All these moments have made the trickier bits this week pale by the waveside. It is these wonderful bits that will keep me going when things are tough in weeks and months ahead and that will make things like the broken ipod today not quite so sore or the cabin days and ‘lost-miles’ days that I know will happen. Thanks for all the messages through the various channels- they are much appreciated, even if I haven’t been able to answer them directly. How wonderful that you’ve had a couple of calmer days and that you are settling into life at sea. Love hearing your phone casts. We’re pulling with you! Hope your queeziness passes soon Sarah. Enjoying your updates. Well done Sarah, … glad you’re queasiness is abating and you’re making great progress…. and from chopping board to air vent …. I’m impressed…. enjoying your updates. once again, am already addicted, loving all the news, ‘tho would have been happier if you hadn’t “rolled”……have had an update from Helen,( who did really well on her walk last week). Countdown now to birthday,only 5/6 days away – sending you lots of love and hoping everything goes smoothly in the next few months. BTW, Olympic flame “running” through Cornwall yesterday and Devon today!! Glad you are having a few calm days. Too bad about the iPod. Now you’ll have to sing to yourself for musical entertainment!!!! Great to hear your phone casts. travel safe……..
Sarah….it’s good to see that you’ve got your whales, dolphins, sharks, birds and Gulliver….”all in a ROW”. Someone had to say it…lol. Have a great second week. No. More. Rolls!!! Either the queasy belly kind or the Gulliver kind! The first week behind you already – WOW!!! Go, Sarah and Gulliver!! Find your all-important groove, Sarah, then dig in and row with love. Great that you’re back on the road… or Ocean. Been looking forward to the blogs for ages. Good to hear that you had nice rowing and met friends. About queasiness, my Chiropractic doctor told me that seize you wrist tight by other hand make you feel better….I’m not sure it works..but I’ve seen wrist bands products which prevent motion sickness. It might work. Cross my fingers no capsize! !